This article is about the 1961 novella. For the 1999 film, see No One Writes to the Colonel (film). 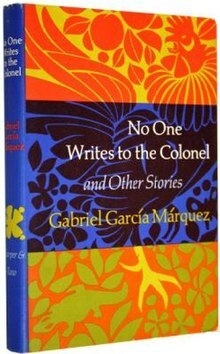 No One Writes to the Colonel (Spanish: El coronel no tiene quien le escriba) is a novella written by the Colombian novelist and Nobel Prize in Literature winner Gabriel García Márquez. It also gives its name to a short story collection. García Márquez considered it his best book, saying that he had to write One Hundred Years of Solitude so that people would read No One Writes to the Colonel. The novel, written between 1956 and 1957 while living in Paris in the Hotel des Trois Colleges  and first published in 1961, is the story of an impoverished, retired colonel, a veteran of the Thousand Days' War, who still hopes to receive the pension he was promised some fifteen years earlier. The colonel lives with his asthmatic wife in a small village under martial law. The action opens with the colonel preparing to go to the funeral of a town musician whose death is notable because he was the first to die from natural causes in many years. The novel is set during the years of "La Violencia" in Colombia, when martial law and censorship prevail. Recent US paperback edition cover. Unlike many other García Márquez works, the novel mostly does not fall within the magic realism genre, as it includes only one magical event. The main characters of the novel are not named, adding to the feeling of insignificance of an individual living in Colombia. The colonel and his wife, who have lost their son to political repression, are struggling with poverty and financial instability. The corruption of the local and national officials is evident and this is a topic which García Márquez explores throughout the novel, by using references to censorship and the impact of government on society. The colonel desperately tries to sell their inheritance from their only son who is now dead and eventually the only reminder of his existence is a rooster that the colonel trains to take part in a cockfight. In his memoir Vivir para contarla (Living to Tell the Tale, 2002), García Márquez explained that the novel was inspired by his grandfather, who was also a colonel and who never received the pension he was promised. However, there is also speculation that García Márquez took inspiration from his experience of unemployment in 1956 after the newspaper he had been working for shut down. The daily lives he witnessed during this time are said to be one of his inspirations for this novel. A motion picture based on the novella was made in 1999. Directed by Arturo Ripstein, it stars Fernando Luján as the colonel. A feature film based on the novella and titled Only Death Comes for Sure was released in 1993. The film was directed by Marina Tsurtsumiya. The Riga restaurant/club Pulkvedim Neviens Neraksta is named after the Latvian title of the story, which also spawned a bar of the same name in Toronto. The Russian rock band Bi-2 had written the song Полковнику никто не пишет (Russian translation for No One Writes to the Colonel) that was included in the soundtrack of the Russian film Brother 2. ^ "Yo creo que es mi mejor libro, sin lugar a dudas. Además, y esto no es una boutade, tuve que escribir Cien años de soledad para que leyeran El coronel no tiene quien le escriba." in Rentería Mantilla, Alfonso, ed. García Márquez habla de García Márquez. Bogotá: Rentería Editores, 1979. ^ "Garcia Marquez - Timeline". Themodernword.com. Archived from the original on 2012-03-21. Retrieved 2012-05-01. ^ "Gabriel Garcia Marquez Biography (1928-)". Filmreference.com. Retrieved 2012-05-01. This page was last edited on 2 April 2019, at 11:22 (UTC).